Conditions of preparation, by the method of solid state reactions, of rare-earth hexaaluminates RE1−x−yMxM’yMgAl11O19 (RE = La, Sm; M, Mt’ = Gd, Yb, Lu, Y, Sc; x, y = 0, 0.15, 0.3), were investigated. For a number of compositions, high-degree single-phase products were obtained applying multi-step heat treatments in Ar/H2 atmosphere at 1650–1690°C. Intense (107) and (114) diffraction lines typical for the hexaaluminate phase have been observed in X-ray diffraction patterns. Studies of microstructure and of elemental composition showed that magnesium deficiency on the sample surface may reach some 20%, while composition in the bulk is more homogeneous and close to stoichiometric. Our estimations of structural homogeneity and thermal conductivity show that lanthanum hexaaluminates La1−x−yMxM’yMgAl11O19 with pair additives Gd-Yb, Gd-Y, Y-Yb, Y-Lu, Y-Sc (x = y = 0.15) and samarium hexaaluminates Sm1−x−yMxM’yMgAl11O19 with pair additives Gd-Yb, Y-Yb (x = y = 0.15), as well as Sm0.7Yb0.3MgAl11O19, may present interest as thermal barrier coatings. Original Russian Text © K.L. Ovanesyan, A.S. Kuzanyan, G.R. Badalyan, A.V. Yeganyan, R.V. Sargsyan, V.S. Kuzanyan, A.G. Petrosyan, V.S. 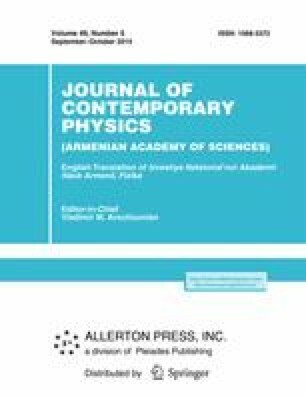 Stathopoulos, 2014, published in Izvestiya NAN Armenii, Fizika, 2014, Vol. 49, No. 5, pp. 342–352. An erratum to this article can be found at http://dx.doi.org/10.3103/S1068337215020188.